As a Colorado homeowner, you are likely a fan of the majestic beauty that the Rocky Mountains provide. You may be amazed by this majesty, but your yard’s aesthetics may not be helping to set the scene. Fencing installation services are one handy way to increase the beauty and functionality of our your outdoor space. From classic wood fences to cost-effective chain link options, residential fencing is available in a wide range of materials to provide consumers with the options needed to balance their home needs, style, and budget. Rocky Mountain Fence & Decks is here to serve as your go-to fence company in Larimer County, offering deck building and fence installation services to transform the beauty of your home in Loveland, Fort Collins, or beyond. We’re dedicated to providing the best outcomes for each and every one of our clients! Our commitment to customer satisfaction starts before you call us. 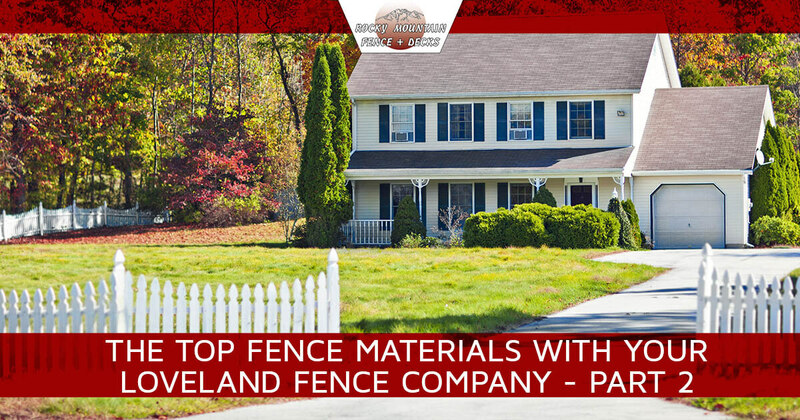 Today, we’ll continue our two-part series by highlighting a couple more popular materials used in modern fencing applications. When you are finished, be sure to contact our fencing company to learn how we can improve your property! This versatile fence material aims to mimic the strength of wrought iron without the weight or costs. Homeowners who are looking for a stylish option can benefit from aluminum, as this material allows for intricate patterns and rich displays that come without the high price tag. Aluminum fencing is also very resilient, requiring very little maintenance while providing superior performance. This residential fencing option is adaptable enough to be used for a variety of landscapes, including steep slopes, swimming pools, and so on. Overall, you can expect a high payoff from this material. If you are seeking privacy, aluminum fencing will not be a great choice. The decorative design of aluminum provides containment, but not coverage. It is also important to remember that aluminum is more pliable than its steel counterparts. A strong wind, impact from pets, or climbing by children can all bend the components of your aluminum fence. While not the hardest components to replace, homeowners who expect a lot of wear and tear on their property may opt out of aluminum. Durability. Vinyl fencing is designed to hold up to the weather and impacts, making it one of the most durable fencing materials possible. Low maintenance. Very little effort is required to keep your vinyl fence looking great all year long. Design versatility. You can choose from an immense selection of colors and styles of vinyl, giving you more control in deciding the final appearance of your updated home. PVC fencing shouldn’t fade or dull over time, leaving your property looking great. Lightweight. Fence installation can be easy for DIYers with many vinyl products. Based on your needs, you may be able to produce quality visuals without the labor costs. While vinyl fencing is great, it is by no means perfect. One concern for many homeowners across Colorado is the cost. Vinyl is meant to provide long-term benefits for your home, but these advantages will cost you more up front. Vinyl is also not as able to withstand impacts as well as wood, putting you at risk for costly repairs if something were to go wrong. Our harsh winters can also make vinyl brittle, making it PVC fencing a concern for those further up in the mountains. The type of material you choose for your residential fencing needs can play a major role in how your fence performs throughout the years. One way to ensure that you are making the best choice is to reach out to our fence contractors for help. Rocky Mountain Fence is here to serve as your go-to fence company in Larimer County, delivering quality results to local residents since 1992. Contact us today to learn more or to receive a quote for your home!